The dream started in 1960, when a group of ski-loving Canadian businessmen returned from the Winter Olympics in Squaw Valley, CA, with an idea: Develop a ski destination in British Columbia to host the 1968 Games. They rented planes and did air reconnaissance, then put on their warmest boots and walked the terrain. They eventually selected London Mountain, a massive summit located high above Alta Lake some 70 miles north of Vancouver. London was renamed in honor of the local alpine marmot, which “whistles” when it communicates—and Whistler was officially born. In 2003, that original dream became a reality when Vancouver and its related mountains, stadiums and athletic sites were selected by the International Olympic Committee as the official location of the 2010 Winter Games. With a then-booming economy showing no sign of stopping, the announcement sent a shockwave through the Great White North’s corporate pipeline, as Canadian companies showed quick interest in attaching to the Games. Domestic Olympic sponsors signed on with the Vancouver Organizing Committee (VANOC) to dominate various category-specific areas, and nowhere was the fight to dominate the 2010 Winter Games more heated than within the telecommunications category. Much like the U.S. rapper wars that dominated music headlines in the 1990s, the fight for the right to the telecom Olympic badge of honor turned into a Summer 2004 “East versus West” battle royale with punches thrown from Canada’s left and right provinces. In one corner, Bell Canada, the beast from the east. In the other, Telus, which controlled the rest in the west. National pride, Olympic honor and business prowess pushed the two companies to try and outdo each other with competing bids. For Telus, the Olympics provided a force field it could use to protect its western region. For Bell Canada, the Games represented a way to go west, a global stage on which to expand its national footprint and a path for business growth. But as always, there can only be one winner, and Bell Canada reigned supreme with a deal that may alter Olympic spending forever, a sponsorship it paid as much as four or five times more for than what the VANOC bid book originally had the telecom category priced at. As a result, the water level rose across the board for the Winter Games. Other sponsors stepped up and paid more. Licensing deals went up. In all, 70 Canadian companies represented $760 million in Olympic sponsorship deals at last month’s Games— up significantly from the $348 million in domestic sponsorships struck around the 2006 Torino Games and the $494 million domestic kitty generated from Salt Lake City in 2002. (Top global sponsors such as Coca-Cola and Samsung bring the sponsorship spending up to $1 billion, and remember that represents only the rights deals, not the incremental activations, which bump total Olympic spending another 30 to 50 percent.) Translation: One could argue that Bell Canada was responsible for Olympic spending getting raised to a new level. And so, for 17 days last month, Vancouver welcomed the world (storefronts and cafes had handwritten flyers taped to their windows that said, “welcome world”) as its guest and the Olympics welcomed Bell Canada as the largest sponsor at the Games. At the heart of many sponsorship activations are hospitality efforts, “guest experience” flights used to engage, communicate and strike relationships with b-to-b prospects and customers—many of the guests represent potential sales of millions or billions of dollars. Hospitality has obviously been used for decades to mix business and pleasure, the combination proving financially successful for many brands. But as the economic temperature started to cool over the last few years, hospitality came under fire as a wasted spend, labeled by some as a discipline that mixed too much fun with not enough business. The result, as you know, was a severe string of hospitality spending cuts and reductions, a record number of cancellations and a p.r. backlash the likes of which the event industry had never seen. 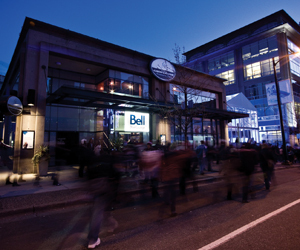 At Bell Canada, the mission remained clear and the hospitality strategy was developed early on as a business-focused, sales-generating endeavor; invite prospects and customers, then use the Olympics as a platform for spending time with them, sharing product and service knowledge with them and then generating sales from them. Use the Olympics to push internal sales reps across Canada to blow through their numbers in exchange for access to the Games. Use the Olympics as a catalyst for engaging customers that had never been engaged. And use the Olympics to build the brand, and the business, in a measurable, trackable way. In a strategic, not just tactical way. In a way that could, and probably would, upgrade how many view, and use, hospitality. Things happened fairly quickly. A strategic hospitality program was developed. And it differed from the norm from the start. Typically, hosting programs feature very upscale hotels for guests or a series of hotels peppered throughout the property’s venues. Bell Canada decided to centralize where guests stayed by booking the downtown Vancouver Westin, taking over every inch of the hotel and turning it into a solid home base. Next came the hosting venue, where guests meet for receptions and meals, usually located within one of the hotels. Bell Canada deviated from that norm as well, taking over a downtown restaurant just steps from BC Place, and in the heart of pedestrian traffic, called Players Chophouse. 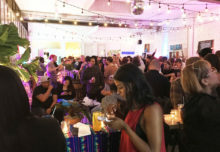 (It sounds simple, but the move was a huge coup that provided a geographic anchor for Bell Canada’s hospitality and b-to-c activations so smackdab in the middle of downtown that many other sponsors immediately felt as if they were “off the beaten path.” The restaurant was closed to the public and rebranded as the Bell Blue Lounge, used for parties, receptions and meal functions. As the hosting venues were selected and the initial cement poured on the foundation of Bell Canada’s program, Phinney’s team began working on who to invite to the Games. The program was framed out around four groups, or “waves,” of guests (40 percent invited from the eastern regions of Canada, 60 percent from the west). Each wave had 250 people, equating to 1,000 folks hosted across the 17 days. But who to invite? Much like Phinney’s initial audit of the company’s events when he first arrived at Bell Canada, the list of potential guests was separated from the want-to-hosts to the need-to-hosts. Phinney isolated only those that represented tangible, future business for Bell Canada. “We focused on the IT decision-maker and the business decision-leaders at the senior level of many companies,” says Brooks. 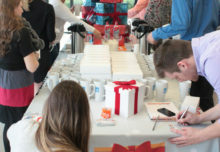 The company didn’t wait until guests landed in Vancouver to begin the brand experience. Bell Canada chartered a fleet of planes from WestJet to fly guests to the Olympics, converting the planes into “first class” cabins by removing middle seats, adding white linen services and other elements. Technology enhancements such as in-cabin videos and noise-canceling earphones were added. “We had to retrain the WestJet staff to provide services they don’t normally provide,” says Duncan. Once guests landed in Vancouver, they were met by ground teams who escorted them to chartered motorcoaches. Like the planes, these were upgraded to white glove experiences—for instance, frittatas were served instead of typical (yawn) boxed lunches. The overall experience for the next few days mixed business and pleasure. Guests learned about Bell Canada from executives, sales reps and company officials. The innovation and technical expertise of Bell Canada’s product and service portfolio was brought to life via Olympic venue tours, executive briefings, access to production facilities and more. Guests attended the Games, medals ceremonies, and were whisked away for some skiing at Whistler. They were treated to concerts, entertainment… and business meetings. Yes, there were optional activities and exclusive access to many things (even the Olympic Superstore, which generated a three-hour line each day, was opened early each morning just for Bell Canada guests). But whether it was a cooking class, a walking tour or skiing, every conversation and activity was tethered to Bell Canada’s product arsenal and a business conversation. 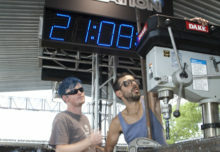 The Olympics ran on Bell Canada wiring, digital pipelines, technologies, devices and servers, and all guests were given access to behindthe- scenes tours of the sponsor’s products in action. Overall mantra: If we can power the Olympics’ telecommunications needs, we can certainly power yours. Example: On the ride to Whistler, Bell Canada tech masters explained how the company literally wired the Sea to Sky Highway that connects Vancouver to the former London Mountain as the motorcoaches rolled. Wave one focused on cio’s and cto’s, existing customers mixed with top prospects (good fodder for some peer-topeer conversations in which happy customers talk to non-customers about their experiences with Bell Canada). “That’s our core client, the person who makes purchase decisions,” says Phinney. The last wave hosted hundreds of top Canadian ceo’s and was considered the most critical of all. The biggest names commanding the biggest companies, all assembled in one place to experience the Olympics—and the technology powering the Games from Bell Canada. Having this group in the last wave allowed for access to Gold Medal games and the closing ceremony. It also allowed any operational wrinkles to be well ironed out before the VIPs arrived. The Bell Blue Lounge served as the physical anchor of all the waves. Guests enjoyed meals, conversations, nightly receptions and intimate entertainment activities. One might assume that ROI on a few hundred million dollars may come much later than sooner. Not Phinney. Bell Canada closed a local deal to install $150 million worth of fire optic cable at the convention center in Vancouver before the Games even happened. “Can I take that number and say the Olympic sponsorship helped deliver a business ROI? Absolutely,” he says. Measurement as a whole has been going on since the opening ceremonies. Each wave of customers was surveyed before and after their respective wave, and lead-generation and demand-generation elements have already been overlaid and are being activated (and tracked). Although the overall Olympic spend is large, so is the expected return. Many of the customers engaged across the 17 days are already in discussions with Bell Canada reps, and the business pipeline is already showing movement. The sponsorship also helped motivate the company’s internal sales force to hit quotas pre-Games, energized tens of thousands of employees and provided some extra lift to business partners and retail programs. And although we’re focusing on the company’s large hospitality program here, Bell Canada didn’t forget consumers, blasting its presence (and Olympic-themed promotions and sales drivers) throughout Canada for months with retailtainment programs and other efforts leveraged across its marketing mix. During the Olympics, the company built a consumer experience next to its Blue Lounge, dubbed the Ice Cube. The temporary environment proved a worthwhile platform for showcasing its brand, products and services. And while sponsors such as Coke and Samsung merely showed off their products in Vancouver, the Ice Cube featured a mini retail store that moved merchandise every single day (see pg. 65 for an overview of the Ice Cube).